We are dedicated to taking the worry out of making your pool beautiful and keeping it in perfect working condition. 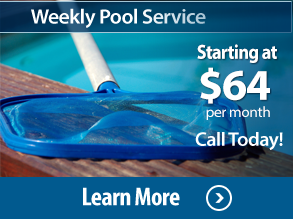 At California Pool Care we are committed to making sure you have the most positive pool service experience possible. We strive to exceed our customer’s expectations with everything we do. With our experience we can provide you with the best service possible and feel fortunate have the knowledge to troubleshoot, repair and install any of your swimming pools needs. It is not about being the largest company around, where you lose personal care and service. It is about consistent top-notch personal service at very competitive prices. 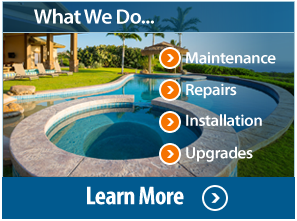 “We have been very impressed by California Pool Care. In the summer, we were noticing that it was becoming a bit too time-consuming to manually vacuum the pool every day. We decided to get a Polaris pool cleaner installed, but since we were missing a “side port” for our pool, we needed to change out an old saltwater port to make it work. We contacted SEVERAL pool companies (at least 15, no joke!). A few were not very good at contacting us back–we’d call or email and never hear back. Some would schedule a time to give us a quote and then never show up. That was totally unprofessional. If a potential customer is waiting at home for you, and you don’t show up at a time that you agreed upon—this reflects poorly on a business. We realized there was a HUGE difference in quality of pool companies. Everything about this company is professional, even down to the estimate and bill that were sent to us. 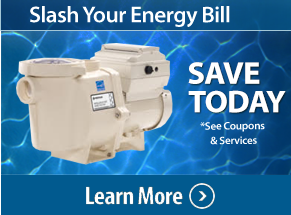 Other companies sent us a simple bill but California Pool Care’s method of billing seemed to stand out among the others. I think it might be the kind of software they use to make their bills look so colorful, concise and PROFESSIONAL (My go-to word for this company). “Bought a short sale home and needed a pool guy to clean up the brown algae filled mess of a pool that was left behind from having no service for almost a year. I called a whole bunch of places and Greg was the first and only one to actually answer the phone. I wasn’t given a voicemail like the others. Since he answered the phone right away we were able to set up a same day consultation. © Copyright 2016, California Pool Care All rights reserved.